We all have a mom. She can be the one that gave birth to you, adopted you or the person that raised you. 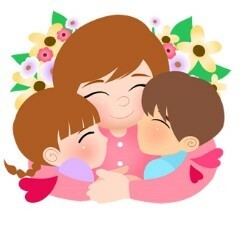 Mother’s Day is just around the corner (May 10th) you have a short time to come up with a game plan to celebrate her. Here are a few ideas to help you find that right gift for the woman that has been your biggest cheer leader. Some of these ideas I have used myself or are planning to in the future. For the new mommy: New moms need a break. Usually new moms are exhausted getting used to no sleep, going back to work, and the responsibilities that go with being a mom. I suggest treating her for the full day. Breakfast, lunch and a special dinner. You do the clean-up too. Let mom relax. If you are wanting a gift, try something very personal. You can print out all the photos of the new bundle of joy and put them in a book. There are many pieces of jewelry that honor’s a mom. Such as: the child’s birthstone for a ring or earrings or charm bracelets. For the youngsters: (ages 0-12) Mom’s love home made things from their children. Have them make a card or drawing. You can take them to a pottery shop that allows them to paint a plate or mug. Some of these places may allow your child to even create something out of clay. You can take them shopping to pick out something ‘they’ think mom would like. Have them help with dinner and chores to make the house clean for mom. How about a picnic lunch with the kids and take plenty of pictures. For the teens: (ages 13-19). You could buy clay pots, let the kids paint something on the pots and have them plant flowers for mom. (We love stuff like that). Since the kids are older, they can do the chores for mom. Have them plan a home cooked meal, where they cook, serve and clean-up. If they have part-time jobs they can take $20 and pick something out that mom would use. For instance: is she is a list maker, a new note pad and a pen. If mom has a hobby: buy something for the hobby. Maybe new CD or DVD. The older teens that can drive can have a date night/day with mom. Take her to see a movie, go hiking. Go to a flower garden or museum. She will love spending time with her kids, especially if she is not paying. For the old-sters: (ages 20 and up). Believe it or not….Mom’s want to spend time with their kids. Take the day and spend it with you mom. She will love the visit. If you can’t spend the whole day with her, do something special for her. Plant her a flower garden. Give her a special gift, like a blanket that has photos all her children on it. Do a photo album with nothing but you and your mom. Take her someplace nice for lunch. Someplace she has never been before and someplace where she can dress up. For the far away Mom: It’s hard to celebrate when mom is in another state. Good news is there are so many things you can still do for her. Make a video of yourself telling your mom how special she is. Write a letter expressing your gratitude. You can send her a nice gift basket or flowers. You can even take some of the above suggestions and mail them to her. Like: the blanket, photo album or jewelry. For the moms that have passed: You can still celebrate your mom even when she has passed. If you dad is still with you, have dinner with him in memory of your mom. If both parents have passed, then grab your siblings have lunch in memory or your parents. You can plant flowers by her head stone. While you are there you can clean up around the head stone and talk to her. She would love that you are cleaning up for her and making things look nice. Plant a tree in memory of mom. Here are some suggested websites that will help you with that perfect gift. Don’t forget to click on the “Photo” tab at the top of my page. You can purchase a photo that might be perfect for Mom. Categories: Helpful Tips, Mother's Day Gifts | Tags: favorite person, Gift ideas, gifts for mom, Helpful tips, Mother's Day, Mother's Day gift ideas, simple things | Permalink.